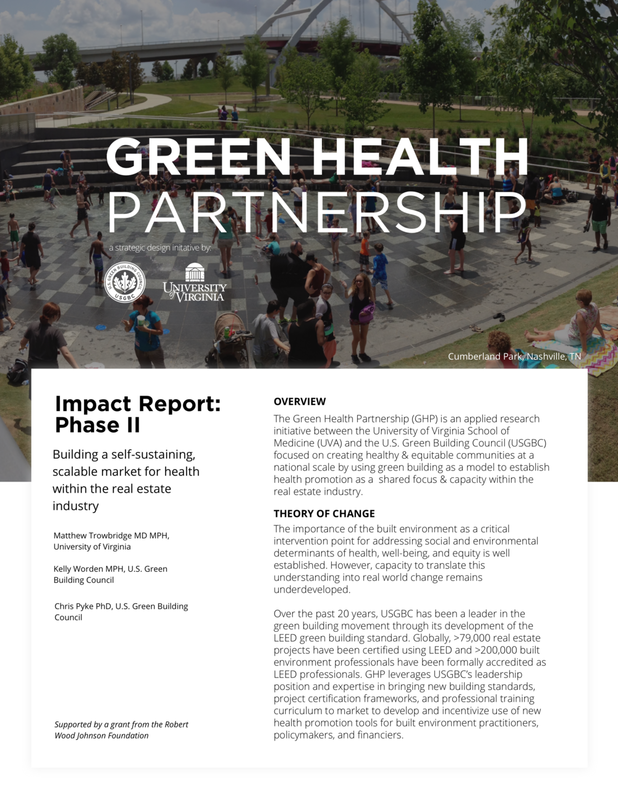 The Green Health Partnership (GHP) is an applied research initiative between the University of Virginia School of Medicine (UVA) and the U.S. Green Building Council (USGBC) focused on creating healthy & equitable communities at a national scale by using green building as a model to establish health promotion as a shared focus & capacity within the real estate industry. The importance of the built environment as a critical intervention point for addressing social and environmental determinants of health, well-being, and equity is well established. However, capacity to translate this understanding into real world change remains underdeveloped. Over the past 20 years, USGBC has been a leader in the green building movement through its development of the LEED green building standard. Globally, >79,000 real estate projects have been certified using LEED and >200,000 built environment professionals have been formally accredited as LEED professionals. GHP leverages USGBC’s leadership position and expertise in bringing new building standards, project certification frameworks, and professional training curriculum to market to develop and incentivize use of new health promotion tools for built environment practitioners, policymakers, and financiers. Variants of GHP’s ‘Integrative Process for Health Promotion’ pilot credit launched in LEED (USGBC), Enterprise Green Communities (Enterprise Community Partners) and Green Star (Green Building Council of Australia) certification systems have been used by >200 built environment projects in the U.S. and Australia since its development in 2015. GHP’s health and well-being indicators for large-scale real estate portfolios (e.g. mutual funds, REITs), launched in 2016 in collaboration with GRESB - a leading real estate analytics group affiliated with USGBC - were used by 252 real estate portfolios and their investors in 2017 to evaluate management of >32,000 real estate assets valued at >$32 billion. GHP’s thought leadership within public health has established new and growing partnerships between public health and the green building industry. For example, the GHP was a founding member of the ‘Joint Call to Action to Promote Healthy Communities’, which continues to grow and now links the American Public Health Association with the U.S. Green Building Council along with multiple other national-level built environment organizations. GHP’s thought leadership within real estate has established health promotion as a focus within leading organizations. Both U.S. Green Building Council and GRESB have committed to increasing the health content of their core products as a direct result of feedback from stakeholders following use of new GHP tools. Similarly, the American Institute of Architects released a set of continuing education modules based specifically on GHP’s Health Process Credit to build capacity for health promoting design among its membership of >90,000 registered U.S. architects.